Renko charts display series of white and black boxes (bricks) to illustrate general price movement and trend reversals. 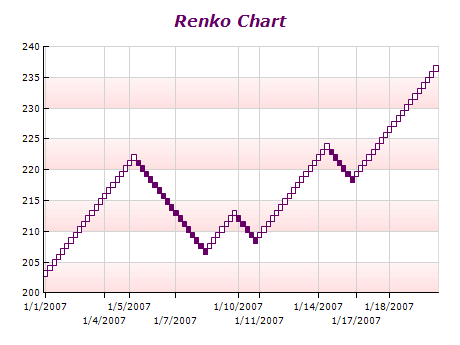 A Renko chart is constructed by placing a brick in the next column once the price surpasses the top or bottom of the previous brick by a predefined amount. White bricks are used when the direction of the trend is up, black bricks are used when the trend is down. All bricks are equal in size. This type of chart helps traders to identify key support/resistance levels.